Ukraine gained independence in 1990, following the break-up of the Soviet Union, but struggled to take its place among Western democracies. Even as the country moved toward membership in the European Union, vestiges of the old Soviet totalitarian system remained, citizens had limited means for civic participation and many stakeholders had little reason to change. The country was ripe for conflict. In what became known as the Revolution of Dignity in 2014, violence broke out between factions seeking stronger ties with Europe and those continuing to identify with Russia. Without a way to express opinions and work together toward peaceful solutions, Ukraine would inevitably remain a tinderbox for violent conflict. Roman Koval of the Institute for Peace and Common Ground (IPCG), formerly the Ukrainian Center for Common Ground, recognized the participatory approach to conflict resolution as a clear path toward a nonviolent civil society. 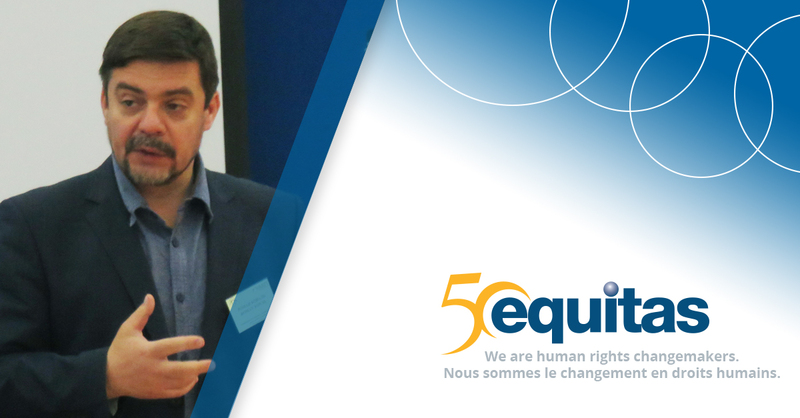 An experienced mediator, Roman began working with the Equitas participatory human rights education program as a training facilitator in 2002. He was well acquainted with the program’s egalitarian approach to education that values all stakeholders’ experience as an input at the first critical step for effective education. Once experience is reviewed, problems are cooperatively identified, participants can learn new information and theory; practice and test new skills in group activities and take action. The process continues in an interactive spiral. Since 2002, IPCG has established a network of conflict resolution experts, dialogue facilitators, and other partner organizations to offer community-based cross-cultural mediations, dialogue circles, organizational development efforts and training in 17 regions of Ukraine. The results have been steady and effective: memoranda of understanding between local organizations, amendments to institutionalize participatory approaches to conflict resolution as communities seek to rename streets reflecting the former Soviet regime, to integrate displaced people from the eastern regions, and to assist ex-combatants. In addition, IPCG targeted the juvenile justice system and the schools for introducing restorative justice methods that could reinforce civic responsibility and participation. During the last decade, juvenile crime was persistent—with more than 35,000 Ukrainian children arrested for various offences in 2011, including armed robbery, bodily injuries, and murder—despite strict, punitive approaches to wrong-doers. In pilot school sites with favorable administrators, Roman’s organization identified youth leaders who already had natural conflict resolution skills and who expressed a desire to become peer mediators. As these youths developed participatory conflict resolution skills, they saw first-hand the model’s effectiveness and became enthusiastic ambassadors. “Some of the best mediators I know are former youth peer mediators,” Roman says. As a result of the “School Centre for Common Ground” initiative, IPCG was able to reach the number of participating schools up to 300 entities, which report a substantial reduction in juvenile crime and conflicts. Students’ academic performance, interpersonal co-operation, and self-esteemed have improved as well. The Ukrainian Ministry of Education and Science together with the Ministry of Interior have recommended the model program as an effective tool for preventing juvenile delinquency, violence, abuse and crime. Among IPCG’s ambitious plans for the future is an expansion of participatory conflict resolution and restorative justice in additional schools and into the country’s juvenile justice and overall legal systems. Toward that goal, the organization’s work has received recognition from the country’s Supreme Court, the General Prosecutor’s Office, and 10 law enforcement training institutes. The organization continues to develop and organize communities through dialogue, participatory problem-solving and leadership training together with the network of 17 partner organizations Ukraine-wide.